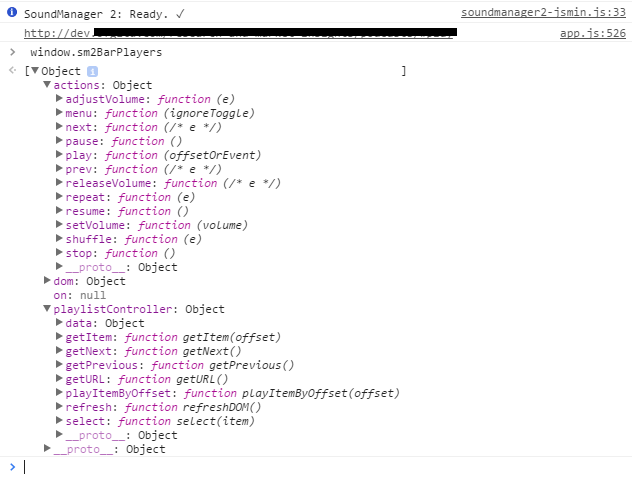 SoundManager2 is a cool library for adding playing audio within web pages. Unfortunately it in itself does not supply a GUI to interact with, instead it provides an API with which to interact with your mp3’s. The SoundManager2 website does show a demo UI that it calls “Bar UI”. It is not integrated into SoundManager2 but is instead a completely separate library. SoundManager2’s website implies by association that one might get Bar UI merely by creating a new SoundManager2 instance but that’s not true at all. I spent some time pouring over the docs expecting to find a config property to set the div element within which Bar UI would be inserted since, afterall, every other widget on the Internet functions this way. Alas, that’s not the case here. So how does one init Bar UI? Well, one doesn’t! Bar UI bootstraps itself when the page is loaded. When this happens it looks for the Bar UI HTML (which not only contains the UI but also the playlist) and if found sets up everything to be interacted with. This means that its incredibly easy to get up and running as long as you understand how to put the pieces together. First download SoundManager2 – easy enough as download links are part of its website. View line 47 above – the unordered list contains your playlist. Simply follow the convention of list items/anchor tags and edit your page as needed. When your page loads SoundManager2/Bar UI will allow you to interact with your playlist. This isn’t the only way to do edit the playlist since there is also an API for Bar UI itself…. You can see the list of methods provided by each where the actions methods deal with manipulating a specific MP3 and the playlistController methods deal with manipulating playlists. If you only have a single Bar UI player in your page then you access its methods via window.sm2BarPlayers. So, if you want to “Play” an MP3 for your lone Bar UI player simply do this: window.sm2BarPlayers.actions.play(). As you can see, jQuery’s append method will add the new mp3 to the end of the HTML playlist. Next, the refresh method call updates the internal Bar UI instance’s playlist.